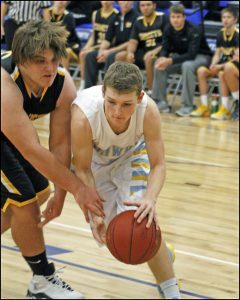 The Lynnville-Sully boys basketball team looked sharp against BCLUW in an unofficial half game at the Montezuma Jamboree last Friday, Nov. 25. This was the Hawks’ first event of the 2016-17 basketball season, giving them a chance to clear any rust before their first game this week. L-S won the half game, 42-10. "It was fun to get on the floor and play someone different,” said L-S Coach Nick Harthoorn. “I thought the guys did a lot of things well. I thought we moved the ball well offensively. There were a couple things that came up defensively that we will have to sure up in practice, but overall it was a good defensive performance." 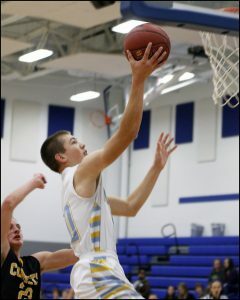 Junior Brevin Han-sen drives to the hoop past his BCLUW de-fender. Hansen scored 11 points in the half game. Junior newcomer Brevin Hansen scored 11 points, making his debut in a Hawk jersey. Sophomore Rylan James hit the double digits as well with 10 points. Junior Jesse Van Wyk scored seven points, and senior Tyler Van Zante tallied up six. Others who scored were junior Drake Ehresman with three, sophomore Grant Wehrle with three, and junior Corey McCoy with two. The Hawks had 12 rebounds in the half game, led by senior John Trettin’s three and two apiece for Hansen, Ehresman, and James. Van Zante stole the ball five times from BCLUW. As a team, L-S only committed three turnovers, while BCLUW had 11. The Hawks’ season opener was set for Tuesday, Nov. 29, at home against SICL Conference opponent BGM. The boys will face another SICL team this Friday, Dec. 2, hosting North Mahaska before heading to Eddyville-Blakesburg on Saturday. Senior Tyler Van Zante has a clear path to the hoop in the half game against BCLUW at the Montezuma Jamboree last Friday, Nov. 25. He scored seven points that night.